Complete, Unabridged Guide to Dakota Fanning. Get the information you need--fast! This comprehensive guide offers a thorough view of key knowledge and detailed insight. It's all you need. Here's part of the content - you would like to know it all? Delve into this book today!..... : By this time, she had received positive notices by several film critics, including Tom Shales of The Washington Post, who wrote that Fanning has the perfect sort of otherworldly look about her, an enchanting young actress called upon . . . to carry a great weight. In the same year, Fanning appeared in three films: as a kidnap victim who proves to be more than her abductors bargained for in Trapped, as the young version of Reese Witherspoon's character in Sweet Home Alabama, and as Katie in the movie Hansel and Gretel. ...In addition, Fanning did voice-over work for four animated projects during this period, including voicing Satsuki in Disney's English language release of My Neighbor Totoro, a little girl in the Fox series Family Guy, and a young Wonder Woman in an episode of Cartoon Network's Justice League. ...Set in South Carolina in 1964, the story centers on Lily Owens (Fanning), who escapes her lonely life and troubled relationship with her father by running away with her caregiver and only friend (played by Jennifer Hudson) to a South Carolina town where they are taken in by an eccentric trio of beekeeping sisters (played by Queen Latifah, Sophie Okonedo, and Alicia Keys). There is absolutely nothing that isn't thoroughly covered in the book. 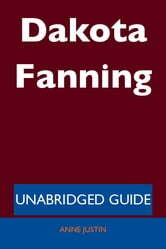 It is straightforward, and does an excellent job of explaining all about Dakota Fanning in key topics and material. There is no reason to invest in any other materials to learn about Dakota Fanning. You'll understand it all. The Encyclopedia of Superheroes on Film and Television, 2d ed.